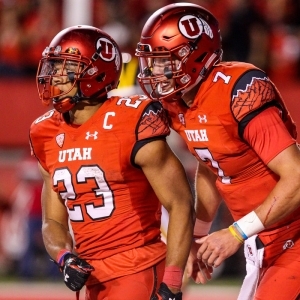 The Oregon State Beavers take on the Utah Utes on Saturday at Rice-Eccles Stadium. The opening line for this game has Utah as 21 point favorites and the over/under was set at 56.5. Oregon State was led in passing last game by Nick Mitchell, who finished with 122 yards through the air. He went 9 for 24 on the game, good for a 38% completion percentage. Ryan Nall led the Beavers in rushing with 122 yards. He averaged 6 yards per carry on his 20 rushing attempts for the game. Jordan Villamin was the team leader in receiving with a total of 65 yards and 4 receptions. He finished the game with an average of 16 yards per reception. As a team in that game Oregon State got a total of 17 first downs by way of 9 rushing, 7 passing, and 1 by penalty. They ran 73 total plays for 401 yards for the game. The Beavers ran for 202 yards on 41 attempts. Utah was led in passing last game by Travis Wilson, who finished with 254 yards through the air. He went 24 for 36 on the game, good for a 67% completion percentage. Devontae Booker led the Utes in rushing with 62 yards. He averaged 4 yards per carry on his 14 rushing attempts for the game. Britain Covey was the team leader in receiving with a total of 129 yards and 7 receptions. He finished the game with an average of 18 yards per reception. Utah got a total of 20 first downs by way of 8 rushing, 9 passing, and 3 by penalty. They ran 64 total plays for 353 yards for the game. The Utes ran for 99 yards on 28 attempts. Oregon State is averaging 20.4 points per game on the offensive side of the ball. They are completing 13.7 passes per game on 28.6 attempts for a 48 percent completion percentage and average 153.1 yards in the passing department per game. The Beavers are running for an average of 189.3 yards per game on 41.1 attempts for an average of 4.6 yards per carry. They also run 69.7 plays per contest and average 4.9 yards per play for an average of 342.4 yards per game. The Beavers are averaging 18.7 first downs per game and they accumulate 62.7 penalty yards per game via 7 penalties. Oregon State gives up an average of 205.3 passing yards and 31.1 points per game on the defensive side of the ball. They allow 19.9 completions per game on 30.6 attempts for a completion percentage of 65. The Beavers give up 197 rushing yards per contest on 39.3 carries for a 5 average per carry. Oregon State gives up 402.3 total yards per game including 5.8 yards per play. They force 1.4 turnovers per contest and get flagged for 6.4 penalties per game that total 60.1 yards as a unit. Utah is putting 34.7 points on the board per game on the offensive side of the ball. They complete 20.9 passes per game on 30.1 attempts for a 69.2 percent completion percentage and average 211 yards in the passing department for each outing. The Utes run for an average of 179.1 yards per game on 40.1 attempts for an average of 4.5 yards per carry this season. They also run 70.3 plays per game and average 5.6 yards per play for a total of 390.1 yards per game. The Utes get an average of 20.7 first downs per game and they average 37.6 penalty yards per game via 4.4 penalties. Utah gives up 257.1 passing yards per outing and 22.7 points per game on the defensive side of the ball. They allow an average of 20.9 completions on 37.3 attempts per game for a completion percentage of 55.9. The Utes give up 113.9 rushing yards per game on 33 carries for an average of 3.5 yards per carry. Utah gives up 371 total yards per game including an average of 5.3 per play. They create an average of 2.7 turnovers per game and 5.4 penalties for 51.3 yards each game.